Coach Rod Sandberg is in his fourth season at the helm of the Pirates. The big story: It's not on the field, or off the field. It is the field. The Pine Bowl, the Pirates' home for more than 80 years, is getting a makeover; the centerpiece is a million-dollar green carpet — a new FieldTurf playing surface. Whitworth was the second-to-last conference holdout; Puget Sound is now the lone team to play on grass. The Pirates are on a strong three-year run (with a 2015 playoff appearance) under Sandberg, who made his reputation as a defensive coach at Division III power Wheaton. 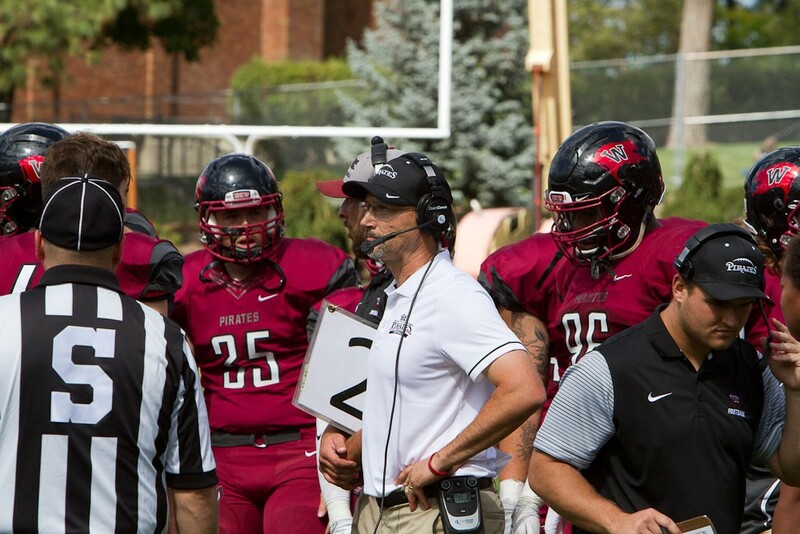 He guided Whitworth to its second straight runner-up finish last year despite a defense that surrendered 30 points per game, giving up more than 40 four times. This year's unit has strong senior leadership in LB Patch Kulp and CBs Taylor Roelofs and LJ Benson, but the line, which Sandberg also coaches, is greener than the new turf. The defense may not have to improve much if the offense plays to its potential. Under coordinator (and former Shadle Park coach) Alan Stanfield, the Pirates throw the ball all over the yard. They were a scoring machine in 2016, averaging nearly 46 points per game and racking up more than 50 four times. Senior Ian Kolste is the NWC's best quarterback, and three senior standouts, Garrett McKay and former Greater Spokane League stars Kevin Thomas (Gonzaga Prep) and Nick Kiourkas (Shadle) lead a loaded receiving corps; last year, the trio teamed for more than 2,200 yards and 21 touchdowns. The big game: One team has stood between the Pirates and first place the past two years: Linfield, a perennial Division III power with 61 consecutive winning seasons, eight straight conference crowns (40 overall) and four national titles. This year's game is Sept. 30 in McMinnville, Oregon, where the Wildcats are 48-2 in their past 50. Last year, the Pirates fell 45-31 at the Pine Bowl, their 10th loss in a row to Linfield.